Get ready for the last installment of The Big Read! 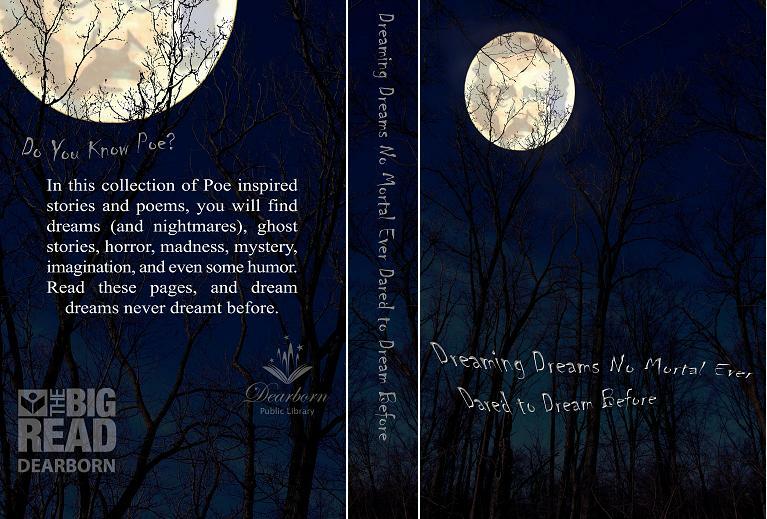 The book of Poe inspired stories and poems, entitled Dreaming Dreams No Mortal Ever Dared to Dream Before, will be coming out soon. Once the book is available, paperback print-on-demand copies can be purchased from Createspace.com or Amazon.com. We anticipate the cost will be $20 per copy. Any proceeds will go towards funding future Big Reads in Dearborn. We will also be adding copies to the library collection, so with a Dearborn Public Library card, you can check out a copy for free. We have over 150 authors in the collection, and the book is about 440 pages long! The book contains an introduction, and eight chapters with author bios, acknowledgements, and an author index at the end. The formatting of the book is similar to the first community anthology we published entitled Call of the Wild Dearborn: Animal Tales, though it will be about 100 pages longer than Animal Tales. We’re very excited about this project! Please visit bigreaddearborn.org for updates, and we hope to have the Poe book available soon–within the next month or so. Thank you very much for your support and for your patience. Regarding whomever this may concern, Hello! I just had a question about the published book and its release date on Amazon. It’s been more than two months since I revived the email which said that we would be able to buy the book in a month or so. I was just wondering when we will be able to buy it on Amazon, and if it would be anytime soon. Hope you can get back to me, Thank you! Thanks for contacting us. We’re very close to publishing it! We hope to send out an email to all authors very soon – in the next week or so.